Donna D’Alessio, MD, founded Montville MedSpa & Pain Center in the heart of Montville, New Jersey to help her community look and feel their absolute best. Dr. DAlessio is board certified in Physical Medicine & Rehabilitation. She graduated from The College of New Jersey before completing her medical degree at St. George’s University School of Medicine in the West Indies. She completed an internship in internal medicine as at SUNY Downstate Medical Center at Long Island College Hospital in Brooklyn, New York. She then went to complete her residency training in Physical Medicine & Rehabilitation at Mount Sinai Hospital in New York City. In her final year of residency training she was appointed and served as Chief Resident. At Montville MedSpa & Pain Center, Dr. D’Alessio strives to restore her patients' optimal health by identifying and treating the source of their pain, instead of masking their symptoms. Under her care, patients receive the most advanced, nonsurgical interventional pain management treatments available. Dr. D’Alessio has devoted her career to promoting healthy and active lifestyles to help her patients. To help her patients reach their individual goals, Dr. D’Alessio also offers multiple cosmetic rejuvenation services such as injectables, body contouring and laser treatments to restore youthful beauty and vitality. Patients in Dr. D’Alessio’s care at Montville MedSpa & Pain Center receive personalized treatment plans to ensure they leave feeling better and healthier than they arrived. 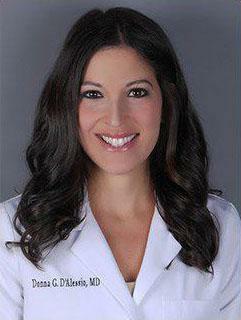 Dr. D’Alessio is accepting new patients in Montville, New Jersey, and the surrounding areas. Call or schedule an appointment online today.